I had to obtain an item and the gentleman on the other end of WhatsApp and I arranged for a time when I would pick up said item. Let’s call this gentleman Mr. M.
Mr. M asked if I wanted to pick the item up from his house or from his workplace. It transpired that he lives around the corner, so I suggested that if it wasn’t a problem, to nominate a suitable time/day and I would pick up the item from his home. A day and time were chosen and I went to M’s home. M is a Holocaust survivor in his nineties, most articulate, speaking an impeccable English. Sitting in his living room, it was apparent that his wife had passed away and M lived alone. I have a nostalgic attraction to older people who can describe the world prior to the Holocaust, and in Mr. M, I had a survivor who had not lost the sharp mind of his youth, and who seemed to remember everything. Stemming from our conversation, it was plain that Mr. M was struggling with the meaning of the Holocaust and the role of God. Indeed, this was subsequently confirmed at our second meeting today. We didn’t speak Yiddish, although I suspect we could have. In fact, I know we could have. Mr. M was born in Vilna. Every person I had met from Vilna, was super proud that they came from Vilna. This was a badge of honour. Vilna! One thinks immediately of the great Gaon of Vilna, Rav Eliyahu ben Shlomo Zalman, the Gra, זצ׳ל. The Gaon of Vilna. Illustration. I could tell that he was somewhat drawn to me because I was “modern”, in the Secular world of academia, and yet committed. It was clear that his view of religious Jews was limited to the Charedi style of Jew. I mentioned Rav Chaim Ozer’s view about electricity. 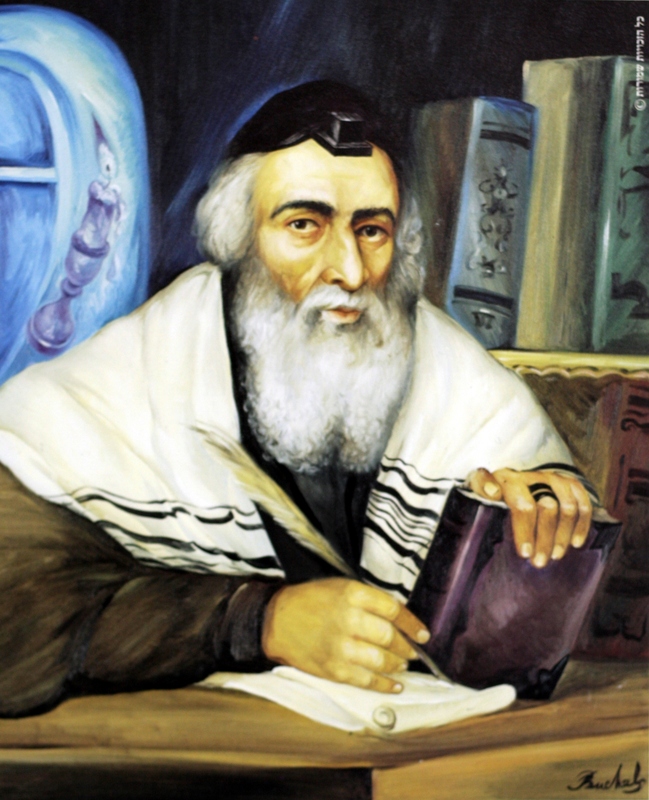 Rav Chaim Ozer held that a bulb with a filament was no different to a candle, and as such, he (like Rav Chaim Brisker and others) used an electric bulb בדווקא for Havdala, and with a Bracha. Here I was, a middle-aged upstart, trying to impress this survivor with my knowledge of Vilna; a tad anachronistic. Rav Chaim Ozer was an immense scholar, and מורי ורבי, Rav Soloveitchik ז׳ל gave a momentous hesped after Rav Chaim Ozer passed away, when Rav Soloveitchik was still senior in the Aguda. I was floored! Feeling mostly trivial, I asked if he could relay a story about Rav Chaim Ozer and himself. He had mentioned that his grandfather was very religious, as was his father. Mr. M remembers as a little boy, people coming over and there were huge disagreements about a Talmudic question. I sensed that Mr. M didn’t appreciate that Rav Chaim Ozer was diplomatically placating him, rather than stating a coarse halacha to a boy. It didn’t matter. We spoke again today for another 1.5 hours, at his request, and I was rather pleased that our discussion apparently went some way to alleviating some lingering questions that he had. For example, today, he asked me point-blank “Who perpetrated the Holocaust, God or man?” I answered that the Holocaust was a tragic exercise of free will, given to humanity. He appeared surprised and was glad I didn’t answer that it was “a punishment for burying mushrooms on Shabbos”. Sadly, there aren’t too many Mr. M’s remaining. I will make an effort to revisit him. Shabbos morning began in the usual way. I awoke, enjoying the extra hour afforded by Shabbos and headed quietly downstairs to the kitchen to enjoy a cup of coffee before davening. I usually read/learn a sefer with my coffee, and this Shabbos was no different. My concentration hasn’t been what it should and I can’t claim too much registered, even while I read “דברי הרב’’. I experience various sources of stress at the minute, and I have come to realise that it’s more difficult to concentrate when one’s mind is somewhat diverted, even subconsciously. Nights can be the worst, as one is unable to consciously control the flight of mind and emotion. Since my father הכ’’מ passed away, I’ve needed to cope with new and significant contributors to higher stress levels and, although I’ve always seen myself as relatively impervious to the rougher waves that life can dispense, I’m not as water-proof as I had previously imagined in delusion. Stepping out into the brisk Shabbos morning air, I began the weekly long and lonely walk to Elwood Shule for Shachris. Elwood is but a shard when compared to its former exalted beauty and glory; but Elwood was my father’s Shule. It was our Shule. I am the Chazan on Rosh Hashono and Yom Kippur, and I daven there daily. My parents were married at Elwood. It was Rabbi Chaim Gutnicks ז’ל first wedding at Elwood. I was Bar Mitzvah’d there, as were my sons. It is, therefore, only natural, if not magnetic, that despite the almost empty and ghost-like pervading atmosphere, I continue this heritage; only now I speak to my father on the occassion, and ask why he isn’t walking with me. I don’t merit answers. It hadn’t been a great week. Two friends recently lost their parents, one to the same dastardly illness as my father. In addition, my workplace is in some turmoil due to an internal managerial episode. I sense my wife and children see my ups and downs, and they are sensible enough to know when to speak and when to stay silent. I thank them for this. As I approached the gates of the Shule, I recalled that it was the Lubavitcher Rebbe’s זי’ע Yohr Tzeit and no doubt the handful of Chabad Chassidim at Elwood would seek to be called up, as is the custom in Chabad. It was also R’ Zalman Serebryanski’s ז’ל yohr tzeit as well as Rabbi Groner ז’ל: a momentous ensuing week. Elwood was rather more vacuous than usual. It seems that not too many had decided to come early. There was hardly a person under the age of 50. Where were all the young people? What is happening to our generation? Many attendees are “JFK” style attendees: that is, they arrive Just in time For Kiddush. What would happen if we didn’t have a delicious Kiddush catered by Peter Unger each week? I’m not a contemplative davener. In fact, I’m now a poor davener. My dialogue with God is quick and lacks a previous more qualitative element. I usually grab a Sefer/Holy book from the Beis Medrash and learn while davening stretches out. I sit in a barren area. It wasn’t always this way. There is nobody in my row, save a plaque remembering my dear father, and the ten rows behind me are void. I (now) make a point of going around the Shule and shaking each person’s hand. It’s what my father used to do. My father הכ’’מ was a far better person than me, though. At that time, I noticed that one elderly gentleman, Mr Tuvia Lipson, had not yet arrived. Tuvia attends weekly. Apart from being a holy holocaust survivor, Tuvia enjoyed a stellar history after the war, joining the Israeli army, and rubbing shoulders with Shimon Peres and others. Tuvia remains an active and positive man. Despite losing his wife many years ago, he picked himself up and continued spreading the mantra that is emblazoned weekly in gold on his lapel, “זכור”-Remember. At one stage of Layning, I noticed Tuvia entered Shule and I approached, wishing him Good Shabbos. Tuvia was shivering and complained that there was a cold breeze running across his back. Asking him to join me in my row, where the heating seemed to be more effective, he readily agreed. So, for the first time, Tuvia and I sat together, he sitting on my father’s seat alongside me. Tuvia whispered that my father used to call him “Pan Parantchik” which means “Mr Captain” in Polish, because Tuvia had apparently been a Captain in the Haganah. Between Aliyos, Tuvia informed me that he had been in Bendigo for a few days. “Bendigo?”, I asked inquisitively. “Were you looking for gold? It’s cold over there”. 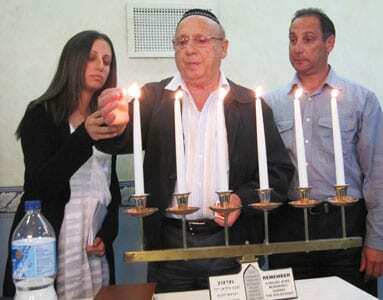 Tuvia responded that he had visited the schools in the area and had spoken about his Holocaust memories and thereafter. This was part of his activities in the courage to care campaign. I shook my head in disbelief, after which he pulled out a wad of little notes and handed them to me. Korach suddenly became less significant, and I was mesmerised by the honesty and integrity of the short vignettes the school kids had penned in appreciation. At that point, I thought to myself, this Shabbos, had already been more significant. It was then that Tuvia proffered another story: one that I had not yet heard. Tuvia was taken aback. How could she know what he had been through. Yes, she had the best intentions, and was willing to let them enter, but she wasn’t Jewish. She hadn’t been persecuted and subject to a policy of mass murder. Inquisitively, Tuvia et al agreed and sat down to hear her story. She had been a little girl of 7 or 8 during the war, and her parents had concealed a little Jewish girl of the same age, under the floor boards of the house. Each day they would feed the young Jewish girl, and in the evening the little Jewish girl would emerge to wash. One day, after two years of hiding, word got out that the parents were hiding a Jew. That, of course, was a cardinal (sic) sin. Suddenly, out of the blue, there was a firm knock on the door, and two Nazi SS officers ימח שמם וזכרם entered demanding to know where the Jew was hiding. Frozen by fear, the lady’s father denied any knowledge of a Jew in his house. One of the Nazi officers became angry, and gave the father 10 seconds to reveal the location of the hiding little Jewess. During this episode, his own daughter, now the older lady, was hiding behind a wardrobe door and watched in horror at what was transpiring. The lady’s mother also stood firm, and after a few moments another shot rang out, murdering her mother before her very own eyes. They left through the front door and the underling trained his gun on the little girl and shot— only at the last-minute aiming his gun upwards to miss the target. The Chief Officer, thinking that she too had been eliminated left together with his underling, “satisfied” with his cruelty beyond human belief and sensibility. Immediately, Tuvia approached Yad Vashem and had the story verified. In fact, the Jewish girl who survived was now living in Haifa and was in yearly personal and close contact with the woman, her saviour. Tuvia organised that a fitting memory be established for the Polish mother and father, who had been murdered as חסידי אומות העולם—righteous gentiles and who are certainly occupying Gan Eden today. I sat there both numb and cold. Had I not asked Tuvia to come and sit with me, perhaps I would never have learned this story. The last past of the Parsha failed to register as this story enveloped my psyche. I don’t have any more to add. I remain in shock and awe. What was designated and planned as a standard walk to Elwood Shule, turned into (yet another) momentous privilege which perhaps served to help me place my own stressors into a more realistic context. This is one you should watch after work, if you haven’t seen it. It is one hour, but worth every minute. I’ve always liked to hear and be regaled by stories and maysalach, especially when retold by or about the generation of holocaust survivors. I mentioned Mr Sperling ז’ל in a blog post when he passed away last year. Here is a Mr Sperling story. I’m sure readers have many stories to contribute. I’m happy to post them as guest posts or in the comments section. Arriving after the war to the shores of Australia, Mr Sperling set about trying to make a buck, any which way. 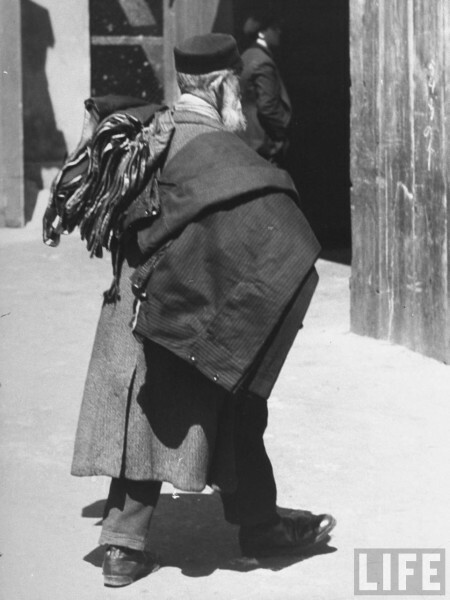 One of his early ventures centered around the role of a travelling salesman in rural areas, where his goods were shmattes purchased “on the cheap” from the many emerging tailors, knitters, and assorted purveyors of quality shmattes. On one occasion he sold a sizeable number of “hoisen” (slacks) to a country shop. After returning to that same shop some months later, the shop owner expressed disquiet about the quality of the stock he had purchased on the previous visit.